Contact ROCKLAND HYUNDAI today for information on dozens of vehicles like this 2017 Toyota Corolla LE. When it comes to high fuel economy, plenty of versatility and a great looks, this ToyotaCorolla LE cannot be beat. This Toyota Corolla's superior fuel-efficiency is proof that not all vehicles are created equal. This is the one. Just what you've been looking for. You can finally stop searching... You've found the one you've been looking for. 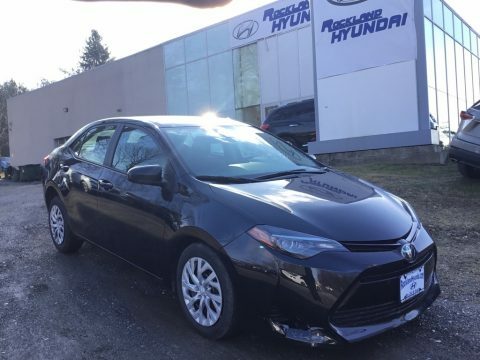 There are many vehicles on the market but if you are looking for a vehicle that will perform as good as it looks then this Toyota Corolla LE is the one! SE HABLA ESPANOL! To view our entire inventory please visit our web site at www.rocklandhyundai.com or call one of our internet specialists (866) 682-6866. ROCKLAND HYUNDAI is proud to announce $ 000 DOWN FINANCING AND TOP DOLLAR FOR ANY AND ALL TRADES!!! Same great price whether it is cash or financed! No GIMMICKS! No HASSLE! Why buy from ROCKLAND HYUNDAI? We are the only one's to offer customers our Exclusive Brake Guarantee on all Pre-Owned vehicles.